Is He Cheating on You? – 829 Telltale Signs by infidelity expert Ruth Houston documents practically every known sign of infidelity, including the subtle signs most people usually overlook. 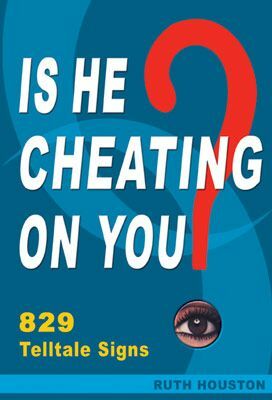 Despite the title, most of the signs in the book apply to both cheating women and cheating men. Is He Cheating on You? 829 Telltale Signs is a comprehensive infidelity reference book that documents practically every known sign of infidelity. No other infidelity book contains as many telltale signs. Based on years of research by infidelity expert Ruth Houston, Is He Cheating on You contains much more than the so-called “classic” signs of infidelity. This book is packed with also includes dozens upon dozens of infidelity signs that most people usually overlook, including numerous subtle signs of infidelity even cautious cheaters are unaware of displaying and thus would never even think to cover up. This easy-to-read and straight-to-the-point, 192-page book contains hundreds of infidelity signs that are conveniently grouped into categories so you can easily find the signs that apply to your relationship, or your mate. Each category contains from 19 to 92 telltale signs, all of which can be found using nothing more than your own eyes and ears, your personal knowledge of your mate, and the information in this book. No software, electronic gadgets, or surveillance equipment required. Despite the title, most of the signs of infidelity in Is He Cheating on You apply to both cheating women and cheating men. Written by an internationally-recognized infidelity expert who is frequently called on by the media to comment on infidelity issues in the news, Is He Cheating on You can help you uncover all kinds of infidelity. Since no two cheaters display exactly the same telltale signs, knowing what to look for is the key. signs even a private investigator would be hard-pressed to find without input from you. Given the rapidly rising rate of infidelity, Is He Cheating on You by infidelity expert Ruth Houston should be mandatory reading for anyone in a relationship, regardless of whether they suspect infidelity or not. If your spouse or significant other is cheating, Is He Cheating on You will help you find out FAST. If your mate is not cheating, Is He Cheating on You can put your mind at ease by helping you disprove what you suspect, and keep you from falsely accusing an innocent mate. Drawing on 9 years of in-depth research on infidelity which began when she accidentally discovered her now ex-husband's affair 20 years ago, infidelity expert, Ruth Houston has written a practical, no-nonsense infidelity reference book that will serve you well for many years to come. Order your personal copy today. As seen on The Today Show, Good Morning America, The Morning Show with Mike and Juliet, Fox & Friends, CNN, ABC News, NBC News, and mentioned in USA Today, the New York Times, the Wall Street Journal, the Los Angeles Times, the New York Daily News, the Chicago Tribune, Cosmopolitan, Chatelaine, Macleans, and many others too numerous to mention.